Our “Reekers flying field” is located at 231 Collins Road, Melville. Heading south out of Hamilton on Ohaupo Road (SH 3), turn right onto Collins Road at the traffic lights, opposite the Urlich Ave Shopping Centre. The access track to the field is located 2.3 km west along Collins road, not long after passing over the railway lines. Look for Fonterra Dairy # 73442 and the Model Aircraft sign on your left side next to a long private acccessway (a tanker track). Take this metal track straight for 1 km south and you will find the flying field on the right hand side. Please drive slowly (no faster than 30 km/h). Park on the sides of the track or in the parking area immediately adjoining the Pits. Visiting Club Pilots and other non-club members may only fly when accompanied by a Club Member or by prior arrangement with an HMAC Club official. 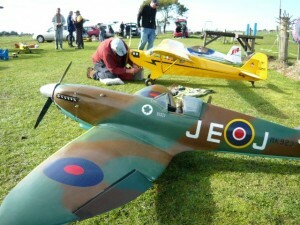 Note the electric fence around the flying field must be errected before departing in all circumstances. The Electric fences must never be left down when no one is on site. As the Airfield is located on Private Property, please treat the property with respect. Remember to DRIVE SLOWLY down the access road. Thanks. 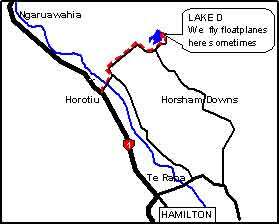 Float Plane Flying: From time to time we also fly at Lake D (Kainui) near Horotiu & Lake Puketirini in Huntly West. Lake D (Kainui) is situated on Lake Road Horotiu. The easiest way to get there is to take State Highway 1 to Horotiu, turn into Horotiu Bridge Road, go over the bridge, turn left onto River Road,then after 400mtr turn right into Lake Road. Stay on Lake Road for 4 Km until you see the driveway to the lake on your left hand side. 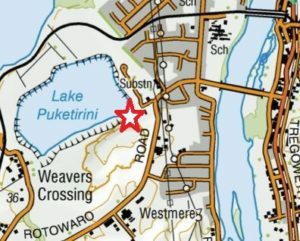 Lake Puketirini is situated on Rotowaro Road, on the edge of Huntly township, west side of Huntly. 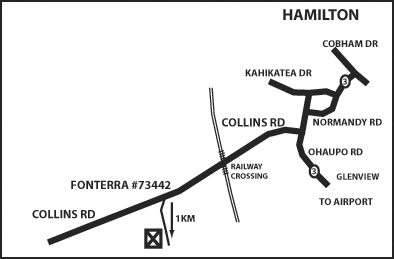 Cross the river from State Highway 1 via Tainui Bridge Road then continue straight on Rotowaro Road until you see the access gate to the main signposted council reserve parking area. Then follow the driveway on the left to the boat ramp parking area. These occur on the 2nd Wednesday of each month (Except January).